Goplus power rack is used for home, office and gym workout. The included bar catches can be used to assist while performing squats, dead lifts, curls, etc. And the reinforced overhead workout bar can be used for body-weight training such as pull-ups, chin-ups, leg raises, squats, dips and more. It has a heavy duty steel frame for stability and safety. And all steel components are powder coated and sealed, so it is easy to keep clean and ideal for years of use. What's more, the anti-skid feet rubbers can avoid damage to the floor. The power rack is adjustable from 11.6'' to 75.4'', and the wide walk-in design offers plenty of side-to-side movement space. Full instructions and all mounting hardware are included. Just waiting for your purchase! The power rack has 29-level adjustable heights (11.6" - 75.4"). All open frame ends are capped for safety and to prevent inner oxidation. A wide walk-in design offers plenty of side-to-side movement space. The anti-skid feet rubbers can ensure safety and avoid damage to the floor. The main frame is constructed from steel, all tube seams are welded to provide additional strength and stability. It's designed for easy installation. Full instructions and all mounting hardware are included. Adjustable Height: 11.6" - 75.4"
Solid Construction for Sturdiness---The main frame is constructed from steel. All tube seams are welded to provide additional strength and stability. And all steel components are powder coated and sealed. It is easy to keep clean and ideal for years of use. Non-Slip Rubber Feet for Safety Guarantee---Non-slip and abrasion-resistant rubber feet can ensure safety and avoid damage to the floor, which make the power rack firmly stand on the floor. What's more, the weight capacity of it is 300 lbs, so it's pretty steady while you are doing exercise. Walk-In Design for Plenty Space---A wide walk-in design offers plenty of side-to-side movement space. 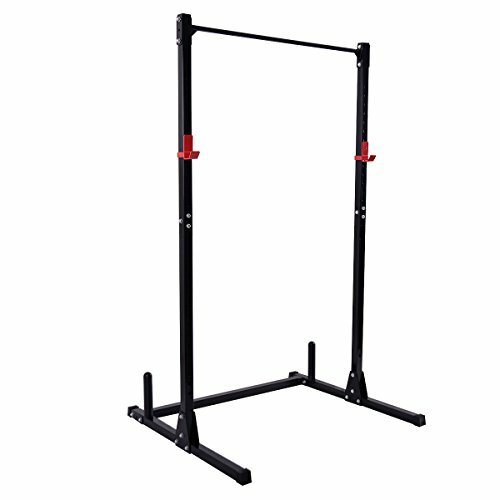 What's more, adjustable barbell rack makes it suitable for a variety of heights (11.6" - 75.4"). Functional Power Rack for Widely Use---Perfect to use for weightlifting, the included bar catches can be used to assist while performing squats, dead lifts, curls, etc. The reinforced overhead workout bar can be used for body-weight training such as pull-ups, chin-ups, leg raises, squats, dips and more. Easy Assembly and Disassembly---With a clear instruction, it can be assembled in only a few minutes and once taken down can be easily stored out of the way. Full instructions and all mounting hardware are included.